Friday night football was Mishawaka vs. Riley. MHS won, 11 to 8. 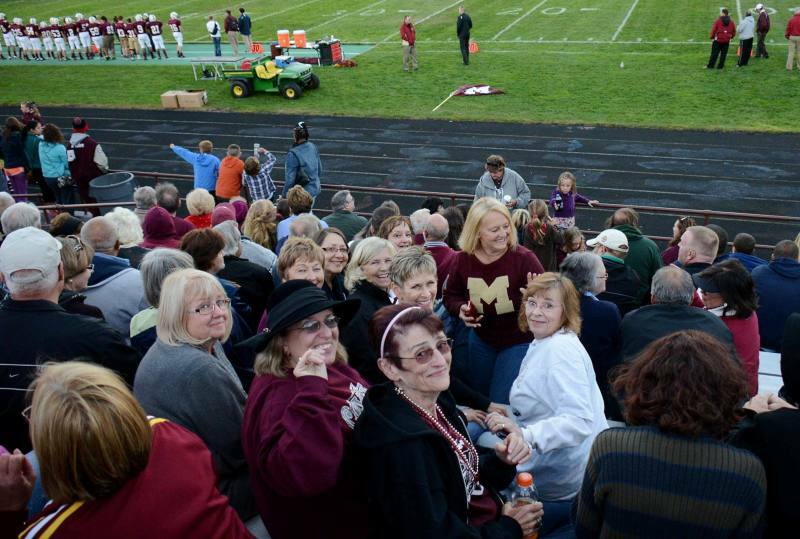 MHS '68 folks at the game were Darlene Lennox, Kathy Klotz, Alice Beard, Debbie Morse, Jim Locke, Bill Daily, Debbie Werbrouck, Jane Zimmerman, Mary Ann Pechi, Mary Rhoade, Margaret Hutchison, Mary Jane Dexter, Debby Parnell, Terry DeMaegd, Keith Cooper, Eve Thompson, Karen Williams, Jimita Baldoni, Steve Cunningham, Ken Brugh, Mike Bellovich, Pam Craig, Byron Aldrich, George Roelandts, Phil Stillson, Hilary Asher, Tamara Reed, and Bill Hickey (Main Jr. High). And there was an assortment of spouses, children, siblings, cousins, and friends. All photos except one are from Pam Craig. Above: Four of the seven cheerleaders from the Class of '68. Far left is Debbie Werbrouck. Next to her is Mary Ann Pechi (in maroon sweater). Next to Mary Ann is Mary Rhoade. In the front on the right (blonde hair) is Jane Zimmerman. Missing cheerleaders were Nanette Schnaible (who phoned in from Mexico at Castle Manor on Saturday), Janis Crook, and Lori Eiswald. Above: Keith Cooper. Keith is the photographer for the Mishawaka Cavemen, and he spent most of the time on the field. He came into the stands to sit with old classmates for a few minutes. While Keith was in the stands, he got the above photo. The faces are Debbie Morse, Alice Beard, Darlene Lennox, Mary Ann Pechi, Debby Parnell, Jane Zimmerman, Eve Thompson, Debbie Werbrouck, Pam Craig, Kathy Klotz. Above: Byron Aldrich is on the right, in the red jacket. Above: Mary Rhoade (on left, face turned) is talking to Margaret Hutchison. Behind Margaret is Mary Jane Dexter. Next to Mary Jane is her brother Pete (MHS '67). Talking to Pete and Mary Jane is Terry DeMaegd. Above, front row, from left: Jimita Baldoni, Karen Williams, Eve Thompson. Behind them: Steve Cunningham, Ken Brugh, Debbie Werbrouck. Above: Begin with the two men standing in the center: Bill Daily (in the Boilermaker jacket) and Mike Bellovich. Standing about two rows behind Bill is Phil Stillson. Seated and immediately left of Phil is Bill Hickey. Bring your eyes back to the front of the photo: In the lower left corner, it's Mary Ann Pechi, Mary Rhoade, Margaret Hutchison, and the woman to the right of Margaret is Mary Jane Dexter. Behind Mary Ann Pechi is Debbie Morse, and next to Debbie is Jim Locke. Above: When it got cold, the cheerleaders put on warm clothes. Debbie Werbrouck said in surprise, "We didn't get to do that!" Back in the day, when it got cold, the MHS '68 cheerleaders had to smile through the cold. Above: Steve Cunningham, Pat Bellovich (Mrs. Mike), Mike Bellovich. Above: Mary Rhoade, Hilary Asher, Tamara Reed. Tammy is talking to Mary Jane Dexter and Pete Dexter.